Jila Mossaed was born in Teheran 1948. Poetry was present to her from early childhood. Her father was, beside his work as a judge, a gnostic poet. Her first own literary breakthrough came when she, at seventeen years of age, had a series of poems published in the renowned literary magazine Khoshe. After studies in both USA and Iran she worked as a screenplay writer for Iranian radio and television. Khomeinis seizure of power in 1979 meant a hardened climate for free culture practitioners in Iran and 1986, the same year she published her first collection of poems, Ghazālān-i chālāk-i khātòirah (”The Fast Gaselles of Memory”), she fled to Sweden with her two children. In 1998, after living in Hagfors and Karlstad, she moved to Gothenburg and has remained there ever since. She has written continuosly, mainly poetry but also in other genres. One example is the novel Īshtār (1995) which is a lovestory set in the Swedish region Värmland and containing double time perspectives and magic. Starting with the collection Varje natt kysser jag markens fötter (2009; ”Every Night I kiss the Feet of the Ground”) she found a more simple and direct approach compared with the metaphorical ornaments that characterized her earlier poems. It constitutes the first part in a trilogy that continues with the books Ett ljud som bara jag kan (2012; ”A Sound that only I manage”) and Jag föder rådjuret (2015; ”I feed the deer”). 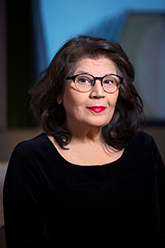 Her most recent collection of poems, Vad jag saknades här (”How I was missed here”) was published in 2018. In the year 2018 she was elected to chair No. 15 in the Swedish Academy, as successor to the author Kerstin Ekman.